Two Bend men were killed in a single-vehicle crash Friday morning on Powell Butte Highway near Alfalfa Road. Crook County deputies responded to the rollover crash shortly before 6 a.m. Upon arrival, they found a Toyota Tundra that had rolled onto its side and crashed into a large juniper tree, crushing the cab. Driver Joshua Eckstein, 19, and passenger Jacob Eckstein, 21, were pronounced dead at the scene. 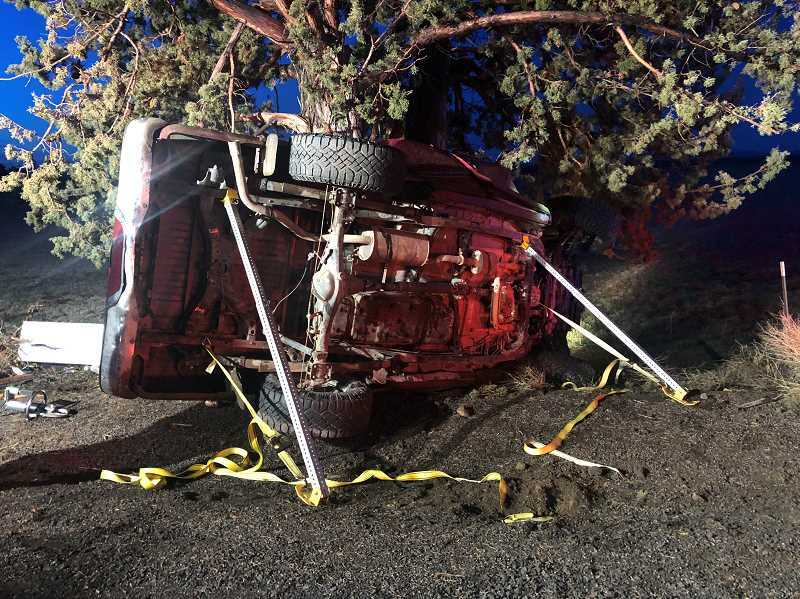 Evidence at the scene along with a witness account revealed that Eckstein was driving eastbound toward Prineville on Powell Butte Highway near milepost 6 when he lost control of the vehicle. It veered into the oncoming lane of travel, then overcorrected and began sliding sideways as it traveled back across the eastbound lane and onto the soft shoulder. The vehicle then rolled onto its side and slid further off the roadway until it collided with the tree. The cause of the crash is unknown, authorities said, however icy road conditions may have been a factor. The Crook County Sheriff's Office was assisted at the scene by Oregon State Police, Crook County Fire Rescue, Redmond Fire Rescue, Bend Fire Rescue, AirLink (Life Flight Network), the Crook County Road Department, a St. Charles nurse, and several citizens. Sheriff's Office personnel reminds drivers to be cautious and slow down as they travel. Due to varying weather conditions, many roads become icy during periods of low nighttime temperatures. Areas of ice are often difficult to identify and can create significant hazards for motorists.